For hours of operation, directions, and more information on the attractions, visit each of their pages above. Looking to bring a group of 15 or more people? Visit our Groups page for special information about group discounts, reservations, and group meal options. Questions about your visit? How much walking? Stroller and handicap accessibility? Visit our FAQs Page for more information. Interested in where to View Seven States on Lookout Mountain? Click to read our guide. Lookout Mountain Attractions also offers several hotel and attraction ticket packages as well as through several area hotels directly. Each of the attractions offer several special events throughout the year. ►Start your day at Ruby Falls! Opening at 8am daily, you can enjoy a guided cave tour to see the world's tallest underground waterfall. Experience the views of Chattanooga from the Lookout Mountain Tower™, Blue Heron Overlook or Village Plaza. Allow approximately 1 1/2 hours. ►Next up, take a leisurely stroll through Rock City Gardens. Each season there's a new reason to visit with changing flora, fauna, and the world-famous "See Seven States" view! Starbucks, Big Rock Grill, Cliff Terrace, and the new Cafe 7 offer a variety of dining choices along the Enchanted Trail. 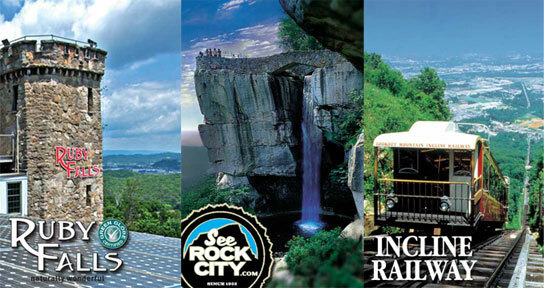 ►Finish your day at the Incline Railway - one of the world's steepest passenger railways. Experience the thrill of riding "America's Most Amazing Mile" as the Incline climbs historic Lookout Mountain. Enjoy the mile high view from the Lookout Mountain station observation deck. Be sure and check out the special events at these attractions seasonally.